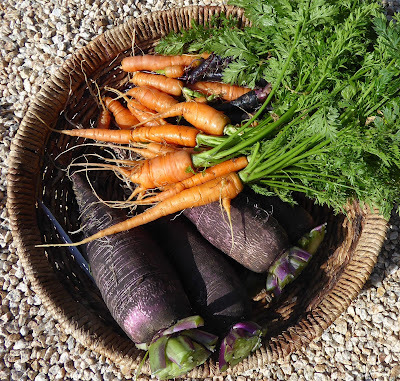 This is one of those harvest posts where you have to look at the same veggies presented in different ways because otherwise there's not much else to see. Here's a combo that I came up with as a side dish the other night. 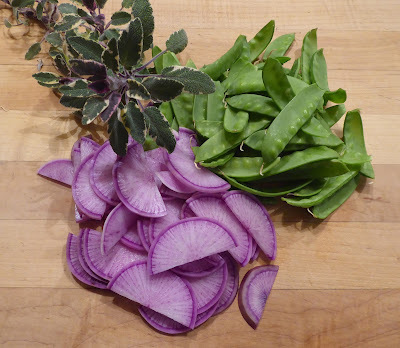 Snow peas and thin sliced purple daikon in sage flavored brown butter. I didn't take a shot of the finished dish but it was pretty too because the radishes retained their color. 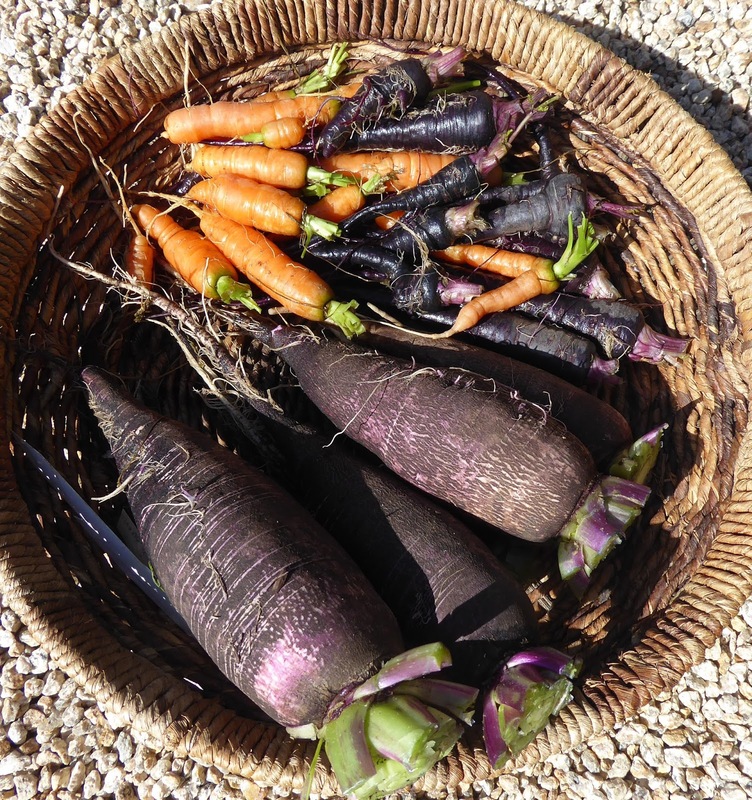 The purple daikons were harvested a while back when I pulled them all out of the garden in a fit of frustration (rage really) when the voles were going to town on seemingly everything and I just wasn't in a mood to share. I was so disgusted by the whole situation that I neither photographed nor weighed the harvests, just lopped off the tops and threw the lot in the fridge. 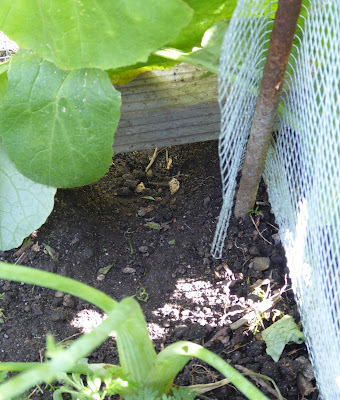 I was really close to just tearing everything out of the garden so that the voles would have to dine elsewhere. Here's a new radish in the harvest basket. 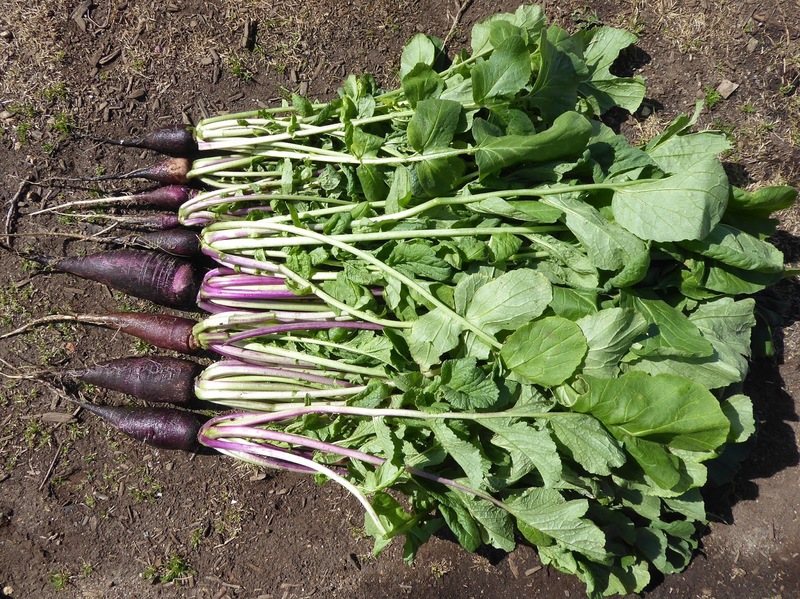 That's just about the entire crop of Violet de Gournay radishes other than some that bolted earlier. I pulled all of them because I feared that they would be the next targets of the voles which have been working their way through the veggies in the bed where I've got had the bulk of the winter crops growing. 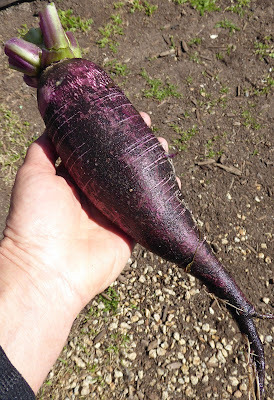 It was probably the right time to harvest them anyway, although it would have been nice to leave some of the smaller ones to see if they would have gotten larger. Violet de Gournay is a French heirloom radish that I first read about in William Woys Weaver's book 100 Vegetables And Where They Came From. 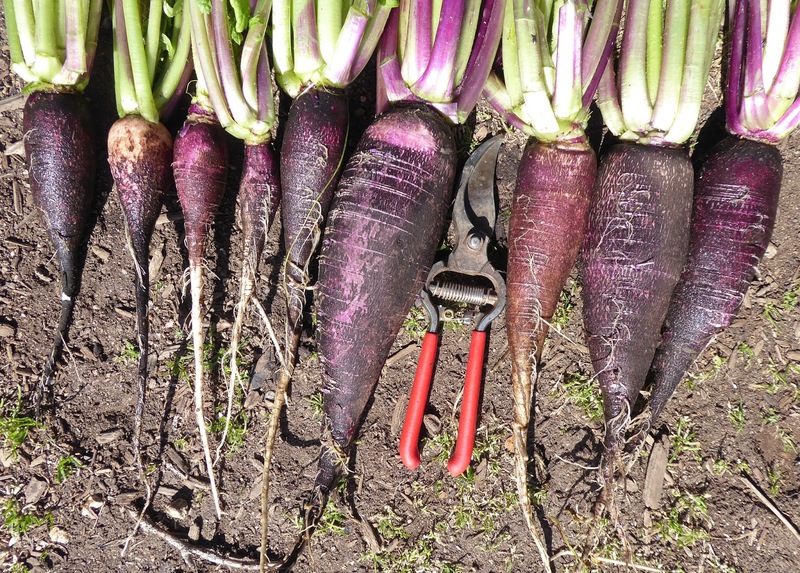 It dates back to the 1850's and came about when a Long Black Spanish radish crossed with a red radish. 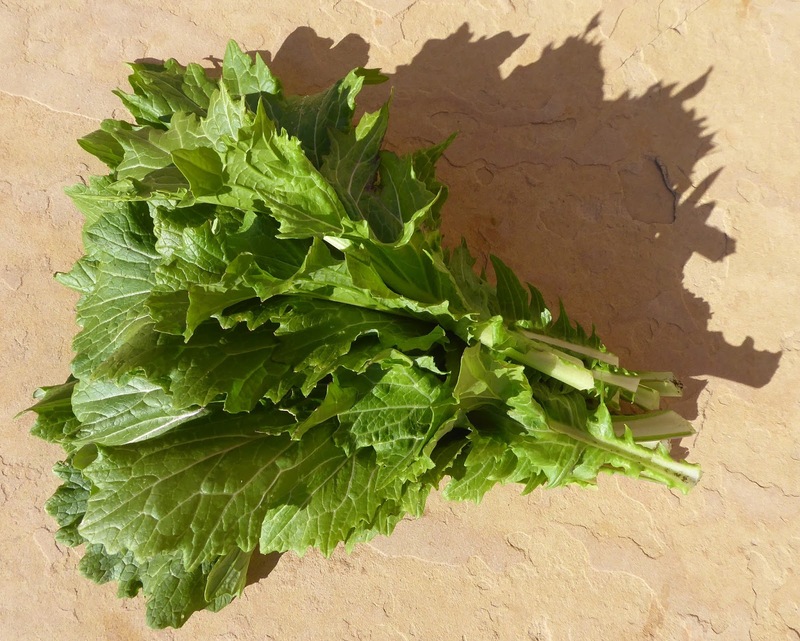 It's a winter radish and "was developed to take hard frosts without splitting and to store well in cool, moist sand. It will even overwinter under cold frames." In Gournay, the town where it originated, it is traditionally cooked with wine, bay leaves, and a very plump duck. I may try cooking it with wine and bay leaves but will probably omit the duck, or perhaps I'll pair it with some of the duck confit that I've got in the freezer. It's also supposed to be tasty raw or cooked like a turnip, with or without the skin left on. I haven't had a chance to try any yet but will report back when I do. I pulled all of the carrots in that bed because the voles were mowing the tops down. They were a pretty wonky bunch for the most part and wouldn't have improved by staying in the garden. The garden has changed enough since the last tour that it's time to do another update. First the good stuff. The favas and Golden Sweet snow peas are coming along nicely. The peas had just been recently set out as of the last tour and they were sitting under the protection of cloches. 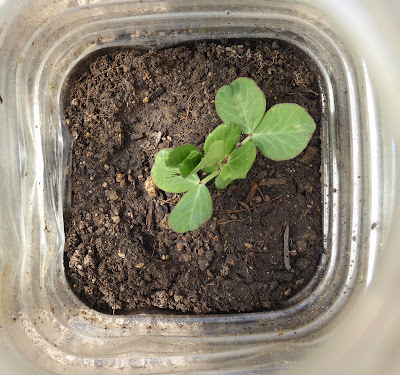 My experiment with starting the favas in paper pots seems to be working, they seem to be quite vigorous and most of them are producing tillers (branching out). The peas look spindly but that just how the Golden Sweet peas are. 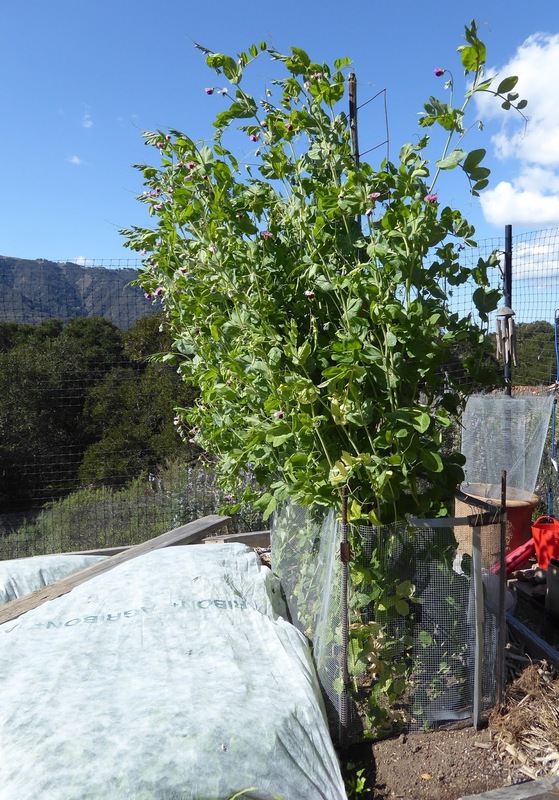 The cloches in the newly installed cages are protecting seedlings of Royal snow peas which I started in paper pots at the end of January and set out last week. 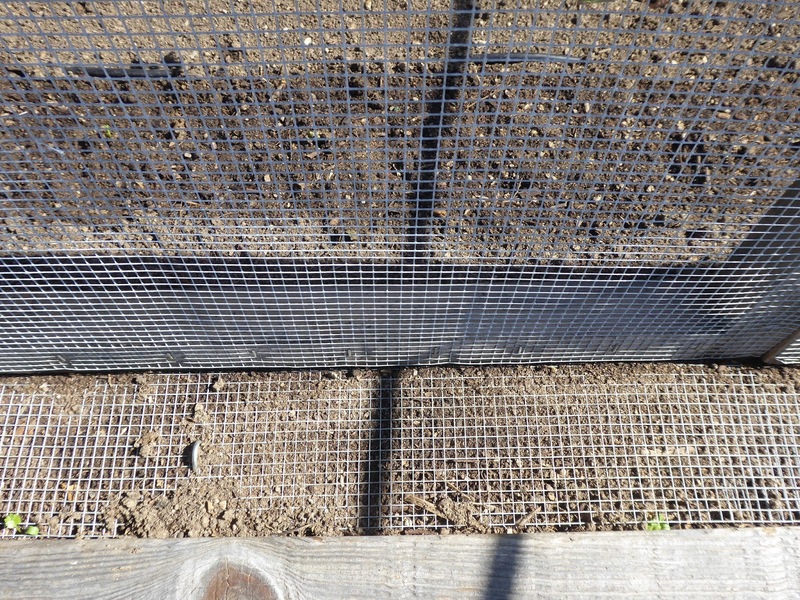 Also in the cage are newly set out seedlings of Little Crunch snow peas which were also started in paper pots. 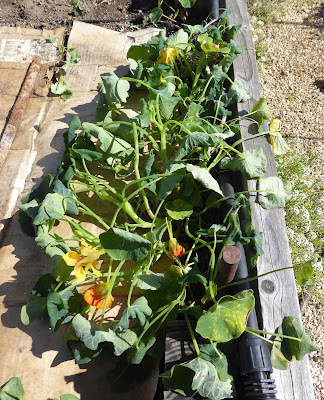 I had to get them into the garden more quickly than I usually do because I was going to be away for the long weekend and I didn't have a place to put the tray of emerging seedlings where they either wouldn't dry out or be at the mercy of weather and rodents. All but one of them are poking through the soil now. 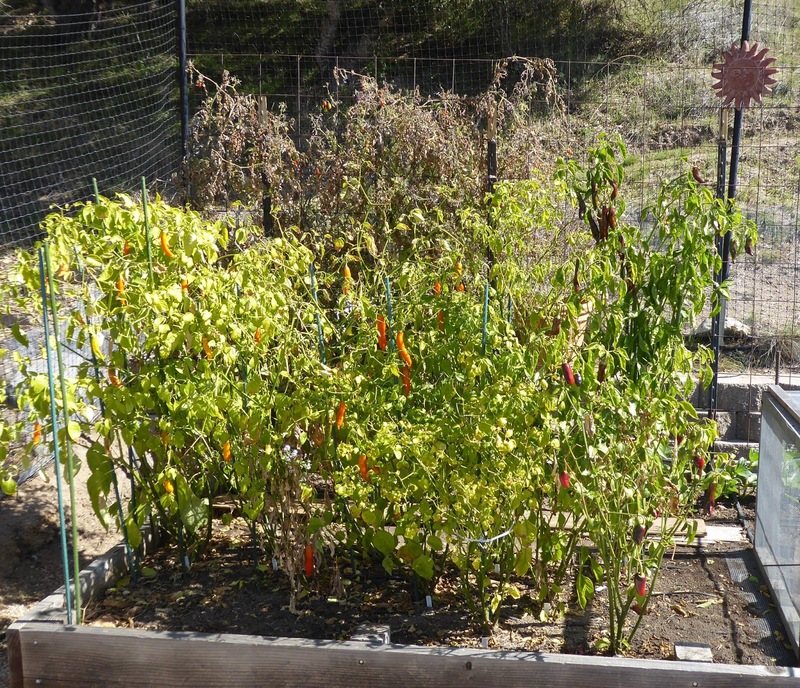 The cold hardy baccatum peppers were unfazed by the 30ºF temperatures the other night. Oooh, but look at those tomato vines in the back. Time to go! 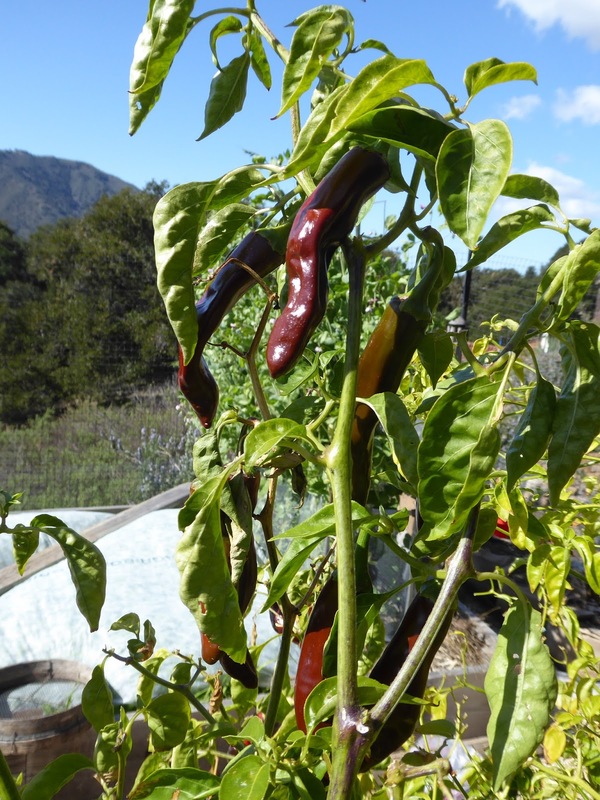 Mareko Fana peppers are annuum peppers but are also remarkably hardy. Plants and peppers are just fine today. Nasturtiums, on the other hand, decidedly do not like being stuck in the deep freeze. 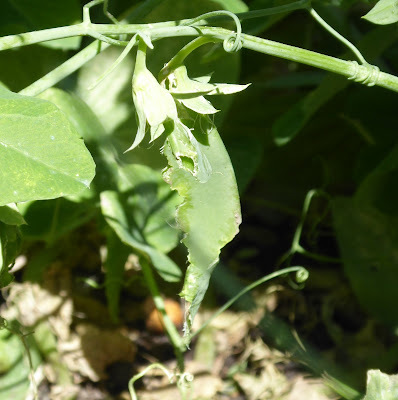 Across the way the frost tolerant Frieda Worlds snow peas were also unfazed, both the plants and pea pods are just fine. I do believe it is time to let the cover crop in that bed out from beneath the protective cover. I'm not doing the tour in the usual bed order because, well, crud, I just don't want to face the worst of it yet. So, the winter spinach is poking along. I haven't harvested any of it yet but something has been working on it. I think it was cutworms so it sprayed it with Spinosad a while back and the nibbling seems to have stopped. Speedy arugula is zipping into seed production mode and I may just let it do it's thing so that I can renew my seed stock. New seedlings are sharing space in the cage. Maybe you can see them here. That's Georgian Flatleaf parsley in the back taking it's good old sweet time germinating, it's been a month. And maybe you can make out a few seed leaves of the Little Hero baby spinach. I started those in paper pots and had the same dilemma as with the snap peas. Over in this corner of the bed is a patch of Cilician parsley which not long ago was keeping company with some old Batavia broccoli plants which were recently tucked into the compost bin. 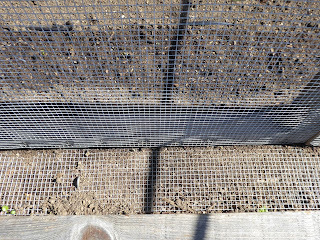 And this section of the bed used to have another cage surrounding winter radishes, Petite Snap Green peas, and carrots. It was time for all of them to go. The cardboard protects the soil until I can get around to growing something. This bed will be filled with mostly curcurbits this year. It's too early to get them going but too late to grow something that will produce a harvest before I need to plant the curcurbits. I should just fill it up with a quick cover crop of mustard greens. The other corner of the bed still has the runts of the garden taking up space and not doing much else - celery, Brussels sprouts, and kalettes. 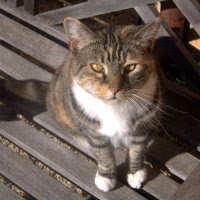 The compost bin has room but I haven't had the time. Ok. Now for the part of the tour that I've been avoiding. Bed #3. Bleah. This corner used to have some really lovely, healthy, growing, just starting to show their stuff kohlrabi. I pulled them out. This spot used to have some new Batavia broccoli plants that were just starting to form their main heads. The mustard was supposed to be temporary company for the broccoli. Here's what's left of a just starting to develop head of Pixie cabbage. It seems that voles don't much like napa cabbage. Just beyond the napa cabbage were a couple of Tronchuda Beira plants just getting to be large enough to harvest from but the voles started in before I did. 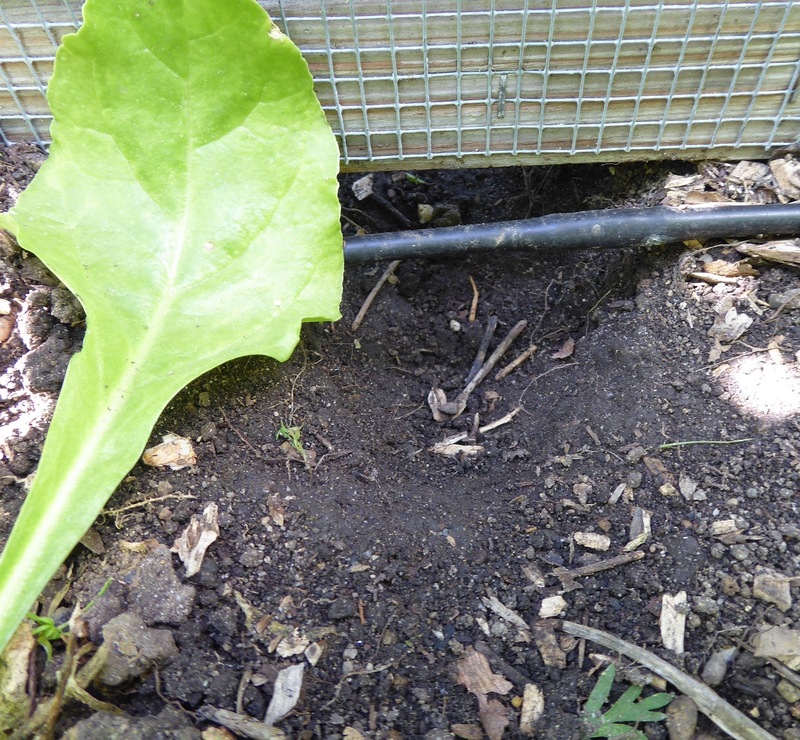 For a while it seemed like the voles didn't like chard. I guess they were just eating their favorites first. My futile attempt at stuffing one the exits of their vast network of runs. Carrot tops and fennel are back on the vole menu again. At least they were until I pulled all of them out of the garden yesterday. 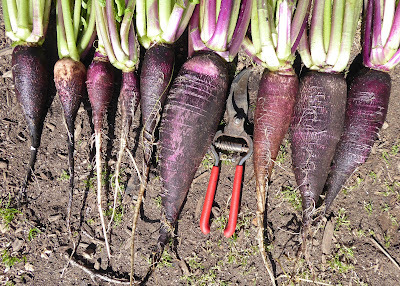 The carrots were wonky anyway which you can see next Monday. Now it seems like snow peas are a yummy vole treat. 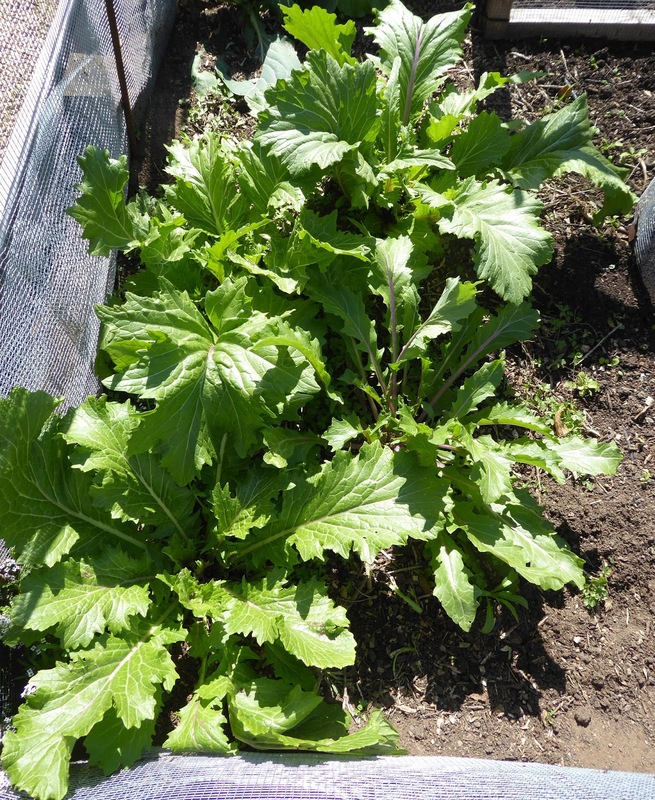 Young mustard plants, oh yum! 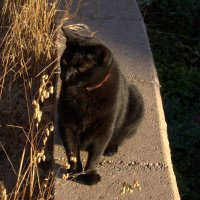 Oh, guess what, here's some damage that I can't blame on the voles. These snow peas didn't like the freezing cold the other night. My fault because I was too tired to get out the frost cloth. Whatever, the voles would have gotten around to eating them anyway. So, I'll end this post on a happier note. Our holiday weekend away was spent getting to the top of a local peak that Dave and I have been wanting to get to for the past few years. 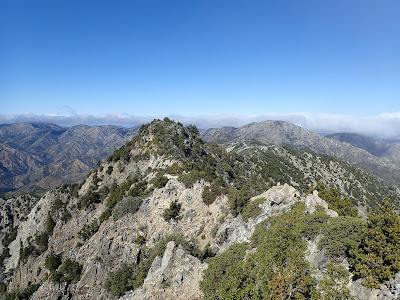 It wasn't possible to even attempt the trip for the past 1 1/2 years because Ventana Double Cone is right at the center of the area burned by the Soberanes Fire in 2016. 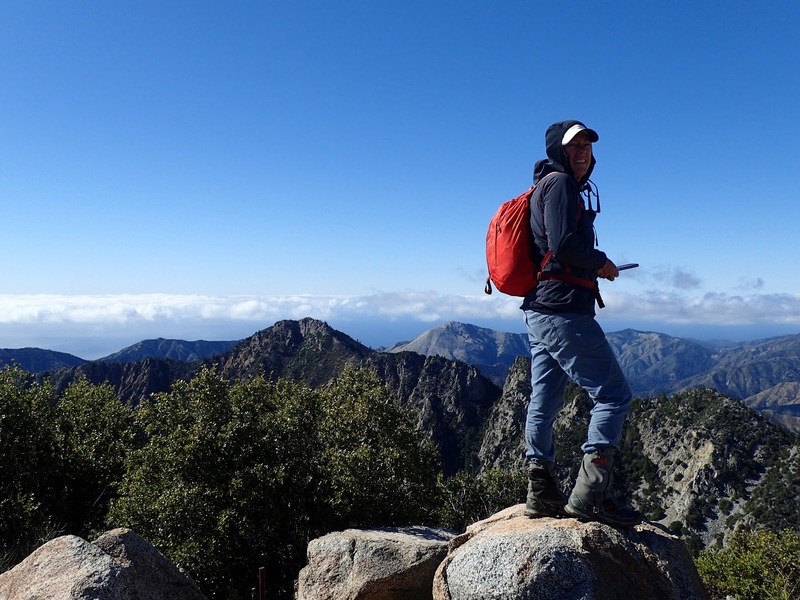 The area was off limits to hiking from July of 2016 until this past November. This past weekend was our chance. It's quite a trek to get to the summit. The closest trailhead is 15 miles from the top and a 30 mile dayhike is not something that we wanted to tackle so that meant at least a couple of nights backpacking. 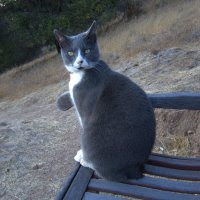 The other challenge to getting to the top is that most of the trails getting there are in very poor condition because of the fire and then the extremely wet winter that followed not to mention a lack of trail maintenance work for I don't know how many years. Just finding the trail at times was difficult and we probably wouldn't have made it without GPS to keep us on track. I'm so happy to say that we accomplished our objective, there I am on the summit last Sunday afternoon. It's difficult to see in the photo, but just next to my left leg there's a notch in the ridge that is called la Ventana, or the Window, and that is the distinctive feature that gives the Ventana Wilderness its name. And just behind my derrière is Pico Blanco, another distinctive peak in the area which we've summited twice. 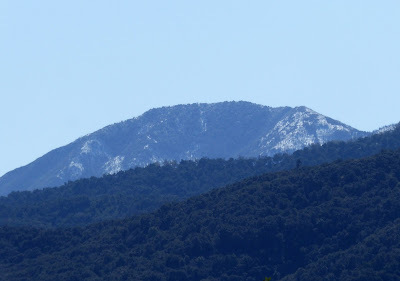 Below is Uncle Sam Mountain viewed from my garden on Tuesday morning. There's snow on that peak. The weather did a quick change on us a couple of hours before we finished out hike back to camp Sunday evening. Oh boy, what fun (hah!) hiking in the dark, on a crappy trail, in the falling snow. We obviously made it safely back to camp. And look what we got to enjoy the next morning, a lovely snowy scene. 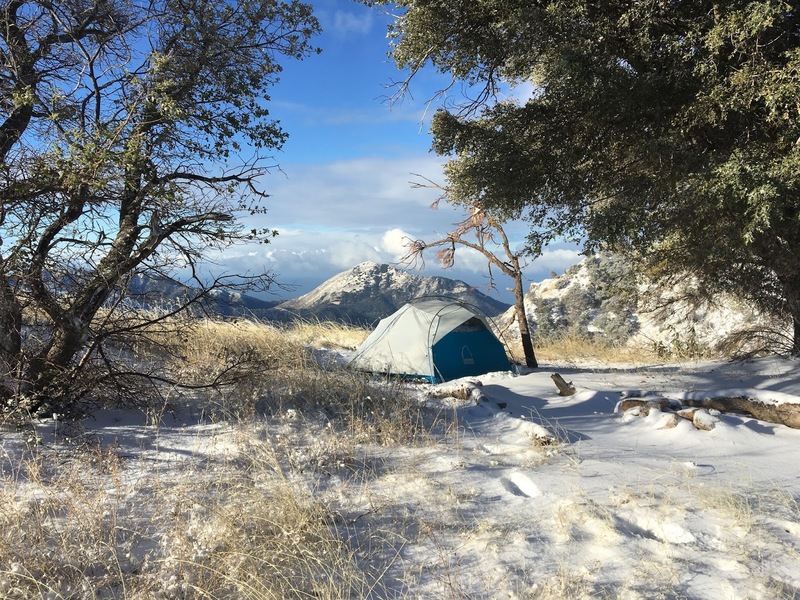 That's Pico Blanco again as the backdrop for our snug little tent. So that's the latest from my garden, thanks for stopping by. 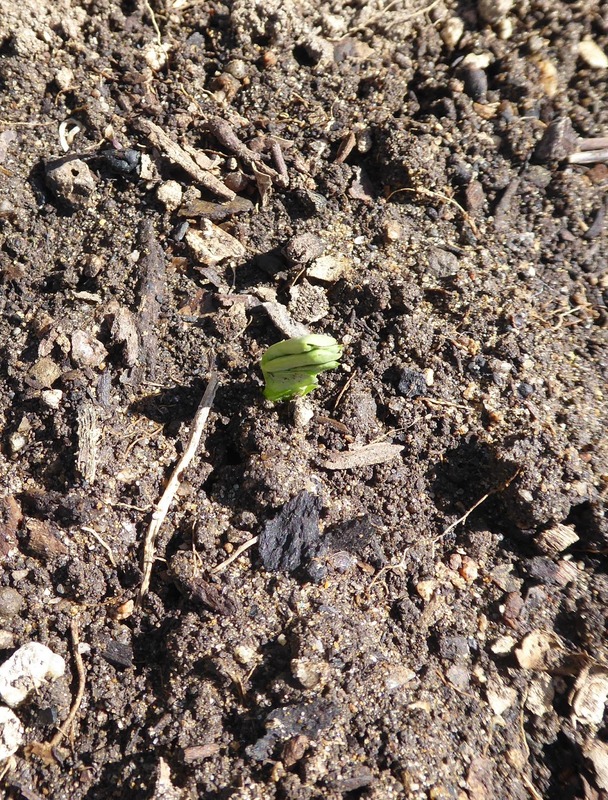 Unseasonably warm weather and sunny skies are prompting spring-like growth in the garden. What a difference a year makes. My February Update for 2017 was all about how incredibly WET it was, complete with a video of a gopher tunnel gushing water. It's not official yet but I have no doubt that we're stuck in drought mode again. The latest long range forecast hints at rain for SoCal next week but won't commit to saying that we too might get some of the goodness. Here's a sign of the weird times, tomatoes ripening in February. I've NEVER had this happen in the 20+ years that I've been growing veggies. The tomato plants are certainly tired looking but look at all the ripening tomatoes on them. Would you be able to cut them down? On the contrary, I think I'll feed them. 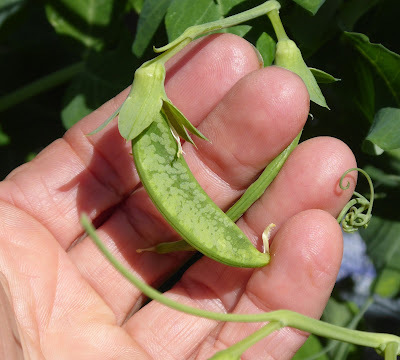 The rest of the 2017 tomato plants are long gone and the space that they occupied is now devoted to favas and a new experiment that is in progress. I've added Golden Sweet snow peas to the mix. They can share the trellis with the favas. I started both the favas and the snow peas in paper pots. This is the first time that I've started favas in paper pots, I usually direct sow them, but I got the tomato plants out so late that I wanted to try to give the favas a faster start and it seems to have worked. Pepper plants still linger in one corner of the bed. I'm trying to get low growing snap and snow peas and chickpeas started in paper pots to plant in the rest of the bed. The next round of snow peas have germinated but I've killed off two rounds of snap peas, they keep rotting. I'm not sure what I'm doing wrong, are snap pea seeds more susceptible rot? You can see in the next bed on the far right that I've got the cage draped with lightweight Agribon fabric. 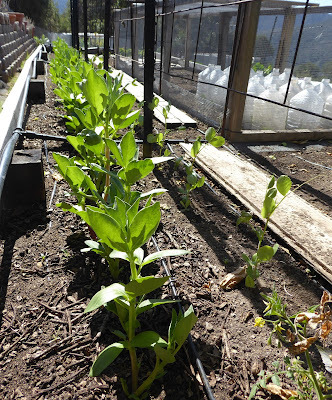 A summer tactic in February, shading the cool weather crops to try to protect them from sun and heat. 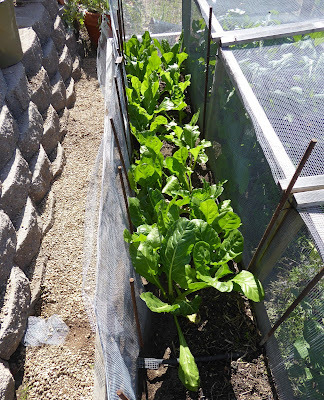 The lettuces are looking really good but I sure hope they don't get the urge to bolt. The overwintered peas are in full bloom. Peas are setting. 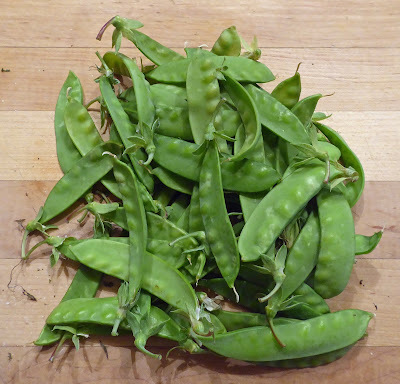 These are shelling peas. The Pink Lettucy mustard doesn't seem to suffer from the warm weather and neither does the Batavia broccoli. But the poor broccoli is still being attacked. I think that this time it's birds, they are after the developing (too early) heads. So after I did the photo shoot I covered most of the rest of this bed with fine netting. 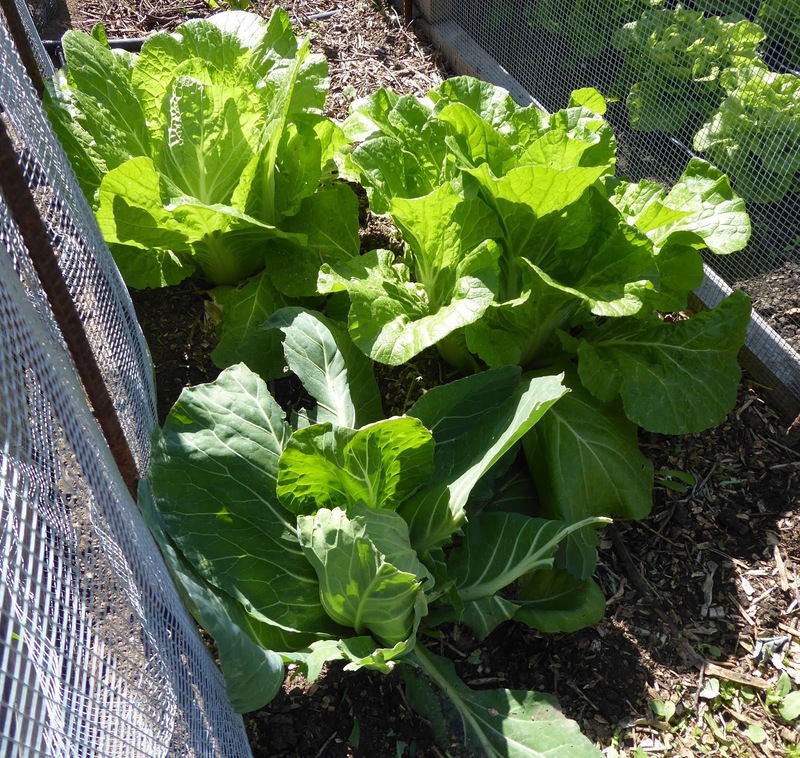 Cabbages are growing quickly, especially the napa cabbages. I can start harvesting Tronchuda Beira. 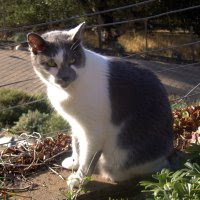 Broccolini isn't happy with the heat. The netting will provide a bit of shade. One of the cabbage plants died so I set out 2 that were held in reserve but I think they stayed in pots a bit too long. 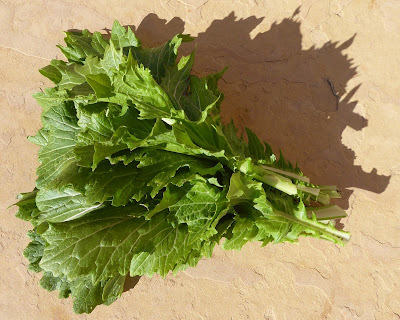 I want to save seeds for Syrian Medieval chard, a quick growing, quick bolting, but delicious variety. A minimum of 20 plants is required to produce seeds to maintain a genetically healthy strain of seeds and I don't remember how many I planted but it's more than 20, many of them are doubled up. 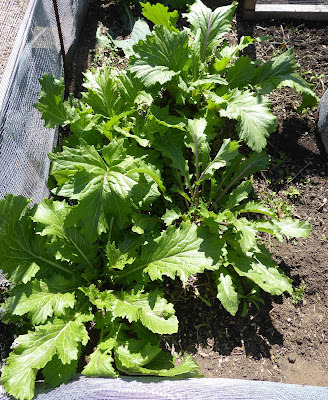 My attempt to force the celery to grow upright and produce longer stalks is working to a degree. I've used newspaper to do the same thing before but that produces a cozy place for the ants to take up residence and farm aphids. Blocking the light would also blanch the stems and I don't want to do that with this celery because of its lovely pink hue. The cover crop in bed #3 is growing well. I'm still keeping it cover with lightweight Agribon fabric both to protect it from the birds and to help keep it from drying out. I've turned the drip system back on but I'm keeping the time on at a bare minimum. The overwintered pole Frieda World snow peas are ready to start harvesting. That's the latest, not a complete tour, just what's new since the last one.